I've started riding mountain bike trails a lot lately. I live in Florida, so please interpret "mountain" loosely. There aren't huge climbs or fast downhills, but there are plenty of difficult, technical trails around here to challenge your skills. Anyway. A fellow rider offered me an energy gel product recently, so I thought I'd see what my wife could get me in a dirty hippie variety. Not because I particularly care about being a dirty hippie, but because I'm curious and she gets a mega discount for being The Boss Lady. 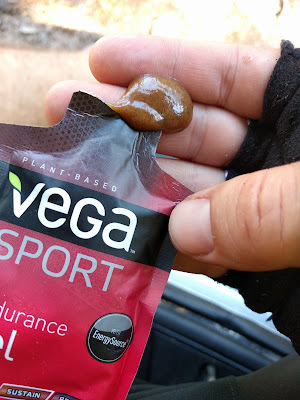 This Vega Sport Endurance Gel has been in our pantry for a long time. Months? Not sure. It has no dates printed on the thing. Judging by the graphics, it must have existed as a product no earlier than 2008. Look, I'm not the one who makes up the names for these things. 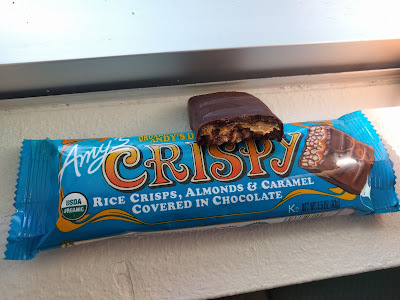 If "Amy's Andy's Dandy Candy Crispy Candy Bar" is tough to parse, that's not my fault. Blame Amy and/or her kitchen for the overabundance of possessives and adjectives. I would explain it all for you, but I have candy to eat and poop comparisons to make. I'm a busy man. This is a candy bar, so it suffers none of the difficulties of protein bars. Meaning it's not difficult to make it look good and taste good. The dark chocolate exterior is mild to moderate: not too bitter, not too sweet. There's enough cocoa content to retain that good dark-chocolate scent. They hit a tasty balance for a candy bar. What I assume is a mix of rice and almond bits in the middle provide a satisfying crunch. There are two individual bars in that wrapper. At 100 calories, one bar makes a decent-but-small snack. Eat both, as I just did, and suddenly you're in Snickers territory. Turn up the spice! The Hot Pepper flavor (with cranberries, wild rice and peppers, says the package) is actually plenty hot. The rice grains are maybe partially cooked, because they're slightly crunchy, chewable. It's unusual. Unlike Tanka's bigger, tastier meat bar (that's not an euphemism), I couldn't actually identify the cranberry in this. Whatever they use as a skin on this thing is a bit more paper-like than any other I've had. It's got more snap to it than even Macho Man could muster, but brother, I'm yearning for more flavor than just this flat spiciness. It's compressed sawdust with pepper. Maybe I'm expecting too much of a meat stick. 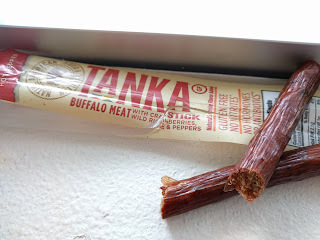 Deja Poop Score: 1/10, standard for meat sticks. My wife took a sip, and in a sour face said, "That's disgusting." 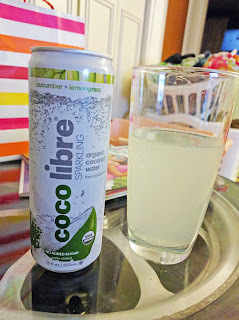 This drink takes all the joy of coconut water, its light creaminess, and replaces it with a combination of tart lemongrass & carbonation with the similar-to-coconut mellow green flavor of cucumber water. It might combine well with vodka or maybe a spiced rum. I don't know if I'd call it disgusting, quite. It does have a certain refreshing quality. But it's so tart that it makes me shudder and the hairs on my neck stand up. The tastes compete with one another and I continually go back to have one more sip. Not so much because I enjoy it, but more out of the morbid curiosity I have for trying to describe its unique, strange combination. Which prompted my wife, "You're still drinking that?" For you, dear reader. For you. But not again. Deja Urine Score: post-coital cloudy. Not recommended for post-coital rehydration unless you hate afterglow.